Planner email notifications are email messages sent only to you and are delivered to your inbox. Group email notifications are email messages sent to all group members. 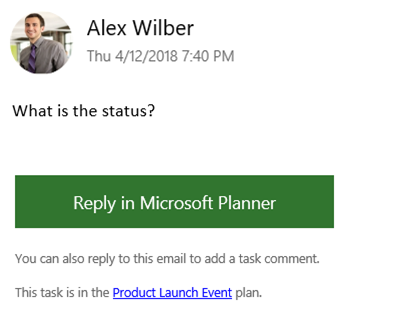 Emails are sent from Microsoft Planner to the group mailbox. For those following the plan's group, these email notifications are not delivered to their inbox. However, if a user posts a comment on a task, the user will receive email notifications in their inbox for each subsequent comment made on that task (even for comments made by other users). The following two images show group email messages. In the first one, a plan member is the first person to comment on a task asking for the status. In the second image, a plan member has replied to the task. The other type of notifications that you can receive are push notifications on the Planner mobile app. Planner mobile app notifications display just like any other notifications on your phone or device. When you tap on the Planner mobile app notification, it will open the Planner app. The following table describes the types of notifications you'll receive, the activities that triggers them, and where you can change the setting. No. You can't turn this off. All plan members receive a welcome email from Microsoft letting them know they've been added to the plan, tips and tricks on using plans, and a link to the plan. Yes. This is on by default. Notifications are sent every day of the week, including weekends. One email and one mobile app notification will be sent for each task that is assigned to you. The email will contain a link to the task in Planner. And the mobile app notification displays just like your other notifications on your phone. When you tap on the Planner mobile app notification, it will open the task in the Planner app. When you create a plan in Planner, an Office 365 group is created. It’s through the Office 365 group that you can post comments and have conversations around tasks. So sometimes you’ll receive email from both Planner and Groups about the same activity. To reduce the number of messages you receive, check out this topic:Plan members: manage group emails for your Planner plans. Not getting email from Planner? If your organization’s product licenses include Exchange Online, you can receive email reminders. If you are using on-premises Exchange Server, there may be issues. For more information talk to your administrator or see How do I make sure all my people can get emails for Planner?. If not, you can give feedback at the end of this page. Be sure to tell us what you were looking for so we can update this article with your questions.